Originally I was signed up for a scuba diving class against my wishes as I suffered from extreme claustrophobia and I had a near drowning experience at 7 years of age, but my son and husband signed me up any way. Needless to say my beginnings in the sport proved to be a catastrophe for the first year. Then My husband sent me to Cozumel and I had a Revelations experience and fell in love with scuba diving. I went onto divemaster and then instructor, shop owner and now I’m an instructor trainer. Since I had so many problems when I started I find it helps me identify problems when others are learning and my specialty is the person who thinks they can’t do it. 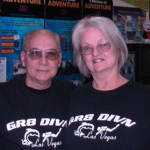 Let me show you how to overcome those instinctive fears and help you learn to love scuba as I do. I can’t guarantee that in 15 years you’ll own your own dive shop, but I can help you enjoy a lifetime of enjoyed shared experiences, just call when you are ready.